Our 16 pt. C2S gloss cover stock is a premium, ultra-thick stock with a glossy finish on both sides — perfect for greeting cards that need to stand out above the rest. If you want the ultimate look and feel for your piece, combine our premium 15 pt. velvet cover with an added soft-touch coating. This premium surface treatment adds a fine, super-smooth finish that makes a bold impact in the hand and on the eye. Nothing gives a more luxurious and sophisticated feel than this paper and finish option. Our 15 pt. velvet cover stock is a heavy, distinctive paper with a velvety smooth finish and semi-matte look with 10 percent recycled content. 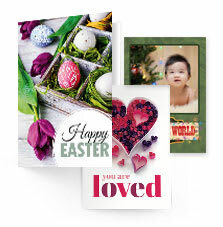 This stock gives a high-end, classic look to any greeting card. Our 14 pt. C2S gloss cover stock is a high-quality cover stock featuring a glossy sheen on both sides - perfect for greeting cards with high resolution and sharp imagery. Our 14 pt. C1S gloss cover stock is a thick, standard weight cover stock with glossy sheen on one side and one side uncoated for printing or writing. Our 13 pt. matte cover stock is an ideal choice for products where a matte finish is desired. It presents a more subtle, sophisticated look. PS Printing Tip: Do you want to write on your greeting card? For easy writing, we recommend our velvet paper stock. Custom sizes up to 13" x 17"
Choose, personalize and print one of our quality design templates. Great Quality and Great Service! 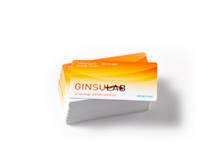 Greeting cards are often employed as holiday marketing tools; but they can be used for so much more. Thank-you cards, birthday cards, anniversary cards: The personal touch of a greeting card makes it an ideal medium for connecting with your customers on an emotional level, and many customers tend to purchase on emotion and justify with logic. 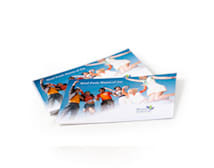 Greeting cards are also part of a valid business strategy for boosting customer loyalty. A variety of printing techniques can be employed to craft a greeting card that is both rich in character and endearing to your recipients. Folding, custom sizes, a foil stamp or die cut will enhance your greeting card and help it stand out from the competition. Try our premium greeting card paper stocks, such as our ultra-thick 16-point paper, smooth 15-point velvet or eco-friendly recycled 13-point matte paper stock. 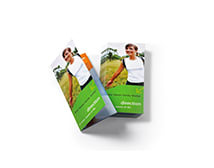 Ask for a free sample kit to see and feel these superior paper stocks. Produced on top-of-the-line printing presses that undergo daily color calibration, we ensure that you receive the best possible greeting cards at an unbelievable price.